How to Make your Will? 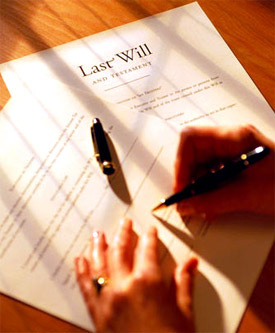 A Will is an extremely personal document. Amongst other things, it is also an expression of your relationship with your family members and other close relatives etc. Your opinions, views and feelings are indicated in this document. It is thus far better to make a personalized Will rather than let the impersonal laws of inheritance take effect. The laws of inheritance do not obviously cater to the special needs and requirements of the members of a family. Let us consider a situation where a person has two sons, one of whom is perfectly healthy, the other being handicapped due to polio from childhood. Now the laws of inheritance would treat both these children on an equal footing. By means of a Will, on the other hand, you have the choice of making a somewhat greater provision for a handicapped son, a widowed daughter or an invalid parent. Again, by means of a Will, you can make some provision for a faithful servant, a nurse, a friend in need of money and so on. All such people would receive no benefit whatsoever under the laws of inheritance in the absence of a Will. Muslims are permitted by their personal law to make an oral Will. It need not be in writing. However in the case of all other religious communities such as Christians, Sikhs, Jews and Parsees the general rule is that for a Will to be valid it must be written. The only exception provided under the law concerns members of the armed forces employed in an expedition or engaged in actual warfare and mariners at sea who are permitted to make an oral Will. Such a Will is known as a Privileged Will. A Will can be made on any plain sheet of paper. It is a mistaken notion that a Will has to be executed on stamp paper. Practical considerations suggest that you use a paper of durable quality in that is does not tear easily through handling. If you wish you can write your Will in your own hand using a ball pen or a fountain pen. A handwritten Will is known as a holograph and is equally valid in the eyes of the law. However, in the case of a handwritten Will, some confusion may be caused by illegibility. For a document as important as a Will, it is generally advisable to have it typed. There should be wide margins on both sides of the paper, as with the passage of time the paper may get torn or mutilated at the edges. As Indian law stands at present the general rule for all communities other than the Muslim community is that it is necessary for a testator to sign or affix his thumb impression on to the Will. In the case of Muslims, no signature is necessary. In fact it is not even necessary for a Muslim to make his Will in writing as he is permitted to make an oral Will. Section 63 of the Act requires you to affix your signature or thumb impression on your Will in such a manner that it should appear that it was intended thereby to give effect to the writing as a Will. This means that you are required to put your signature or thumb impression in the space provided on the last page at the place where the Will ends. If instead of doing so, you put your signature on some other place or at a different place, your Will would be regarded as invalid. If your Will runs into several pages, it is not necessary under the Act for you to sign on each page. However it is a good idea for you to do so. You could sign at the top left hand corner of each page or at its foot. This will conclusively establish that each of the pages is a part of the Will and will also prevent the substitution of a page by an unscrupulous person. Apart from your own signature, it is also absolutely essential that the Will be attested by at least two witnesses. A Will which has been signed by you but has not been attested by two witnesses is invalid and not worth the paper it is written on. It is important to bear in mind that each witness must actually see you sign or affix your thumb impression on to the Will, or receive an acknowledgment to this effect. Similarly, each attesting witness must sign in your presence. Even though it is not strictly required by the law that both the witnesses be present at the same time, it is a good working rule to follow that you and your witnesses are all present simultaneously, so that each person can sign in the presence of the others. You must of course be the first one to affix your signature or thumb impression and the two witnesses can then follow suit. ‘Signed by the within named testator Shri................, as his last Will and testament in our presence, all being present at the same time. Thereafter at the request of the testator and in his presence and in the presence of one another we subscribed our respective names. Your Will should be properly typed in double space. The individual words should stand out clearly. There should be no overwriting, whether between lines i.e. interlineations or in the margins. If you find that you have left out a particular word or sentence, it is better to have that page retyped. Similarly, no words should be scratched out or obliterated. Section 71 of the Act provides that no obliterations, interlineations or alterations in a Will shall have any effect unless such alteration has been executed in the manner provided for the execution of Wills. This means that in the event of there being any alteration the testator and the witnesses should put their signatures in the margin or on some other part of the Will opposite or near to such alteration. Thus we see that in the event that the formalities prescribed under Section 71 of the Act are not complied with, there is a legal presumption that all alterations etc are made without the consent of the testator. However, as suggested earlier, unless there is an emergency, it would be generally far simpler to have the page (s) containing the alterations retyped. The attesting witness and his or her spouse must not be a beneficiary under the terms of your Will. In such an eventuality the validity of other bequests under the Will will not be affected, but the bequest in favor of the witness and his/her spouse would be invalid. The validity of the attestation shall not be affected if the person attesting the Will is a beneficiary, or his/her spouse is a beneficiary. However the bequest in favor of the person so attesting - or in favor of his or her spouse - shall be void. The idea behind this particular provision of the Act is that an attesting witness who is also a beneficiary under the terms of a Will may be tempted to depose falsely regarding the manner of execution of the Will. It is desirable that the witnesses should not be very old. Since your Will could remain in effect for a number of years you should preferably choose a witness some years younger to you. They must of course have attained the age of majority. If the attesting witnesses are younger to you, there would then be a greater likelihood that at least one of them would outlive or survive you. Under the law it is mandatory to register various classes of documents such as sale deeds, gift deeds, partition deeds, relinquishment deeds and other such documents. These documents generally involve the creation, termination or transfer of an interest in immovable property. A Will also creates an interest in immovable property, but being a post mortem disposition of property it becomes operational only upon the death of the testator. Since the execution of a Will does not result in the immediate transfer of an interest in immovable property, it is therefore not necessary to have it registered. Registration is purely optional. Even though it is not required of you that you use any formal, legal or technical language in drafting your Will, it will be worthwhile for you to familiarize yourself with some common phraseology and methods used in drafting Wills. Most Wills which are written in English use a formal conventional beginning, viz. Our testator has married twice, his first wife having passed away. He has two children from his first wife and none from his second wife who is still living. His second wife was herself previously married and has children from her previous marriage. These children have been formally adopted by the testator. ‘Whereas, I am the exclusive and sole owner of the following immovable properties. Further, that after this marriage my first wife Smt .......... expired on ....... at ........ and thereafter in May 19......, I remarried one Ramola daughter of ......., AND further that there were no issues as a result of this my second marriage. Who will be the executor of the Will if it is desired by the testator to appoint an executor. Depending upon the wishes of an individual testator, he may choose to bequeath certain immovable property exclusively and absolutely to a particular beneficiary or jointly to two or more beneficiaries. Similarly, the testator may choose not to bequeath a certain immovable property absolutely, but bequeath only a life interest in the property. He may direct by his Will that his widow have the right of residence in a certain portion of a property after his death and during her lifetime. If one's children are citizens of U.S.do they need bank account in India to transfer their amounts or can they get bankers cheque and encash it in any bank in India? My mother intends to bequeath her immovable property through will in my favor and all her movable property equally among my sisters. Can my sisters who are the beneficiaries sign / attest the will as witnesses. What is the implication on transfer of immovable property to me. Please advise. clarification sought: my close relative has two flats one in chennai and another in mumbai. he has bequeathed by 2 separate wills one property to his son and by another will the other property to his daughter. he is nomore. is there any legal hassle. the will bequeathing property to his daughter is witnessed by his son and the other will bequeathing his other flat to his son is witnessed by his daughter. there is no dispute/disagreement between brother and sister and they are accepting the documents. there are no other legal heirs to the deceased person. My mother made a will.She did not registered it. Is it a valid document? My father made a will in favor of me and my son.There were Two witnesses one my wife and other my uncle.So will i benefit from the will or not?